On Friday August 24th, Apple laid the smackdown on Samsung in court in their ongoing patent trials (click here to view the verdicts). 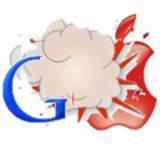 But many are speculating that Apple has a bigger fish to fry, better put a whale; Google. Ok, so I admit THAT quote was a little “non-Cold Warish”, but it’s evident this is just the beginning. A square off between the two titans, and not the buddies they partially or fully own, is imminent. The question is, when? This isn’t exactly just two mediocre companies trading barbs Jerry Springer style. These are two top-dollar elites staring each other down at the weigh-in, and it’s going to be a fight everybody sees. Google has been doing well with the Android OS, and Apple is acting like the contender gunning for the current champions spot, and making an example out of everybody on the way there. Now we know that a fight between these two are going to happen, but more importantly, what does it mean? What happens if Apple wins? What happens if Google emerges victorious? If Google puts the hurting on Apple, it’s a rap. You can expect companies coming out of the woodwork with their own devices utilizing the Android OS in some form or fashion, or even worse, taking a feature that Apple has made famous but can’t control as their own. But if Apple wins, Google may have to leave the mobile phone game alone for a while, and this will strike fear in the smaller companies as to who the top dog is. And what happens to all those who have bought those phones, especially the Samsung models? Recalls? No more future updates? Either way, I can’t see them killing each other’s pockets to the point where they’re filing bankruptcy or one can buy out the other, but this will be an expensive and hard fought war that will not end with either side having no scratches. And as reported on Fortune’s Tech page, if Apple is indeed gunning for Amazon next and succeeds in taking them down, Google better start prepping for war.